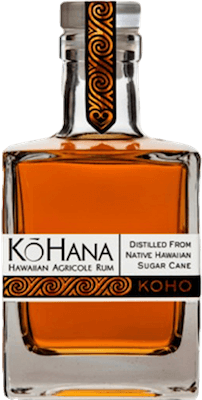 Have you found an online vendor selling Ko Hana KOHO? "Koho" means "to select or choose." This rum spent 3–6 months in new oak, then 18+ months in (primarily) bourbon barrels before being bottled at 45% ABV. Really playful nose. Vanilla/caramel, cherries, oak. Slightly reminiscent of a wine barrel ageing room. Tastes delicious. Punches above its weight. This is a fantastic agricole! Why only an "8" rating? Agricole isn't really my favorite style. But this is a great agricole! It's $45 for a half size bottle, and well worth that price for the style. Smells and tastes of caramel, sugar cane, oak, cinnamon, and honey. Again, a very fine agricole!